The present communication warrants the presence of significant anti-melanoma bioefficacy in the native bark ethanolic extract (65.15%) of the plant Madhuca longifolia. A family of seven flavonoids has been ascertained in the bark ethanolic extract of the target plant using HPLC-ESI-QTOF-MS analysis as bioactive constituents. 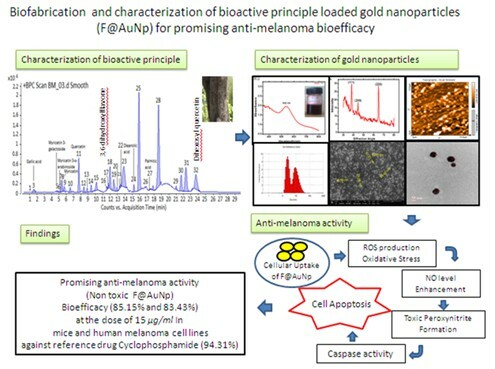 Statistically, significant (p<0.05)enhancement in the anti-melanoma bioefficacy (85.15%) has been successfully attempted, reaching near to the level of reference (Cyclophosphamide drug) using bioactive principle (flavonoid) loaded gold nanoparticles (F@AuNp). In vitro anti-melanoma bioefficacy has been measured against two melanoma cell lines (B16F10 and A375) using MTT and SRB bioassays. Noticeably, the native bark extract and F@AuNp did not show any toxicity towards normal lymphocyte cells, highlighting their safe and non-toxic nature. The pathway of observed anti-melanoma efficacy of (F@AuNp) has been discussed based on our experimental findings on percent inhibition in mice and human melanoma cell lines, production of intracellular reactive oxygen species, the release of nitric oxide, and increase caspase-3 activities. 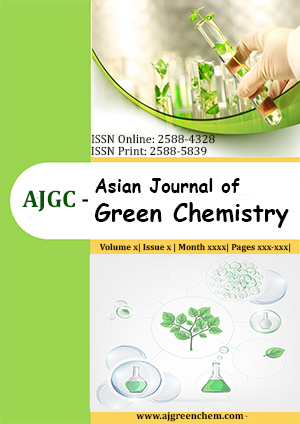 The native bark extract of the plant M. longifolia and its bioactive principle loaded gold nanoparticles possess bright prospects for the development of complimentary herbal nanomedicine for scaling-up the anti-melanoma bioefficacy.